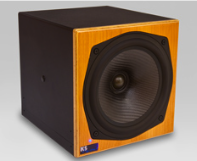 Good things come in small packages... KS Digital C5 Active Nearfield Studio Speakers. The C5 is KS Digital's smallest bi-amplified nearfield studio monitor, about 8" cubed… but don't let its diminutive size fool you. Designed as an optimized modern version of the classic Auratone, it is the ultimate full-range "cube" style speaker. With a 170W bass amplifier, 70W treble amp, 58 Hz to 28 kHz frequency response, and full dynamic range, the C5 can handle complete mixes as your "A" speaker. Engineers are shocked when they hear the open highs, defined mids, and precise lows coming out of this time-aligned coaxial monitor. This is the perfect ultra-portable solution for video editing suites and bridge-mounting on mixing consoles. 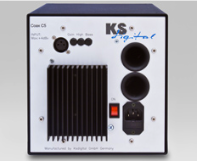 The KS Digital C5 is a self-powered, bi-amplified, full-bandwidth 2-way speaker. Contained inside is a handmade LF carbon fiber waveguide cone within a 6.5" diameter chassis, with a separately-mounted center HF driver. For precise coaxial performance, these time-aligned center HF/LF drivers mean there are no dispersion anomalies vertically or horizontally, and the C5's optimal impulse response means excellent frequency response and phase coherency. The resulting sound output is precise and sonically neutral, giving you the most accurate full-range presentation you've ever heard from studio speakers of this size. It is also magnetically shielded, so it's safe to use next to your computer display. Easily portable, east to mount, the KS Digital C5 fits any situation. The fast-acting MOSFET power amp is mounted on the back of the speaker, as well as an XLR input, volume control, bass level control, high frequency level control, low frequency bass ports, IEC power, and on/off switch. Add our ADM B2 or ADM B3 subwoofer for even more low end, and if you need the amplifiers separate from the cabinet, we provide C5 units with separate components. This is not your father's Auratone-style speaker… this is a high-performance, high-output, high-resolution active studio monitoring system that you can trust for the most delicate mixing tasks. As with all our nearfield studio speakers, the KS Digital C5 is hand-built in Germany for you and comes with a signed Certificate of Authenticity, as well as a full 2-year warranty. ...The Coax C5 captivates by its very pleasant, well-balanced sound and ability to provide the listener with extended work periods without ear fatigue. It has a precise and dynamic low end that is very true in its frequency response, as well as silky, present (but not penetrating) highs. The mids are detailed as well—clear and transparent. … The generously equipped power amplifiers can handle all near-field situations. 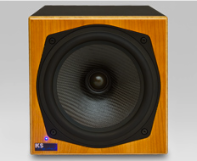 … The C5 is the ideal studio monitor, especially in difficult acoustic environments that force the engineer to listen at a short distance to the speaker. ...Crystal clear, transparent, and accurate reproduction, both for test signals as well as stereo/multi-track sources. … With the C5, KS Digital has created a professional and very high quality studio monitor both for sound recording and video production. This compact speaker does not color the sound, and enables consistent, reliable judgment for all playback sources in any near-field application. ...The C5 by KS Digital is only tiny in dimension. It is really powerful, and precise in its sound. Without a subwoofer, it goes down to 68Hz (new design is now 58Hz! ), which is plenty for many applications. This is a first choice for mobile, remote applications as well as meter bridges in recording studios. ...At first sight you may be reminded of the legendary passive Auratones, which have not been made for quite some time. There was a principal attached to those rather plain-sounding monitors: “If the mix sounds great on the Auratones, it sounds great everywhere else.” Some of that philosophy also counts for the C5 monitors, although the C5’s are on a much higher level in regards to features, components, and useful applications. … We were much more relaxed than usual listening to the C5’s in a near-field setup, over the Yamaha NS-10’s usually sitting in that same spot (which have to be positioned further away and need more volume to make critical decision). … After several days of mixing, two remixes, and listening to several reference CD’s for the ultimate test, it is not easy for us to let these speakers go. With no doubt, these near-fields would enrich any recording studio. The clear definition and excellent reproduction quality at all levels of volume were especially convincing. In the recording studio, they enable you to work for more intense periods of time without fatigue. … Anyone looking for a high-end 5.1 setup should listen to these in combination with the KS Digital subwoofer. ...German manufacturer KS Digital developed a very special coax driver set that reduces the influence of room acoustics in an absolute near-field monitor setup at distances of 3 feet or less. … Well, this is the way you should hear it! It became obvious to me that these speakers still allow good judgment even in a problematic room. There was fun involved in listening, and I was ensured the right balance of all instruments when playing around with a mix I was currently working on. The compact size of the C5 would not make you assume it would have such a complete and big sound. I can only say, well done! … The C5 can be named a true problem solver on a very high level of quality. ...I can attest to the extended top end on these little boxes. You’ll hear the upper-end “air” that could be missing in a lesser system. … As a secondary speaker system, the C5 Tiny is a winner. It gives mixing or tracking engineers another reference to use with their primary transducers. Broadcasters will like these for voiceover and radio work. Music mixers will have plenty of SPLs, and the speakers’ small size could make them highly useful in a remote truck or mobile rig. The extended top end really gives you an idea of what you may be missing up in the attic. Dimensions H 20 x W 20 x D 23 cm, 8" x 8" x 9"